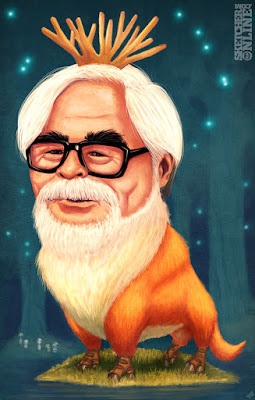 This is Hayao Miyazaki. It was done for Caricaturama Showdown 3000 on facebook. I am posting some work in progress shots (WIPs) and the final image. I started sketching him out in Photoshop and I first envisioned him as Prince Ashitaka from Princess Mononoke. I put on the movie as I worked on this piece. Then I saw the spirit of the forest and I thought of changing the concept to that. I flattened the layers with the background and added some base tone. I then added a CURVES adjustment mask to give the shadows and the highlights different colors. I made a new layer and set it to overlay and added the base colors. I also tried a new layer and set it to COLOR on different parts of the body because I didn't like how they were coming out in overlay. I recommend experimenting with different layer styles. You can always get happy accidents by experimenting. I added more depth to the background by insinuating trees. I then added a painted canvas texture to the whole piece. I imported the texture, inverted it and desaturated it. The normal look of the texture was making my piece too dark. I toyed with adjustment layers of brightness and contrast throughout the making of this piece. I created new layers set to overlay to make colors pop. I also tried something new with the brush which was to set it to color dodge. I did this on the orange fur of the body. I sample the same base color and changed the brush setting to COLOR DODGE. I then painted on a little bit and this gave me a more vibrant orange. I changed the brush back to NORMAL and kept painting. 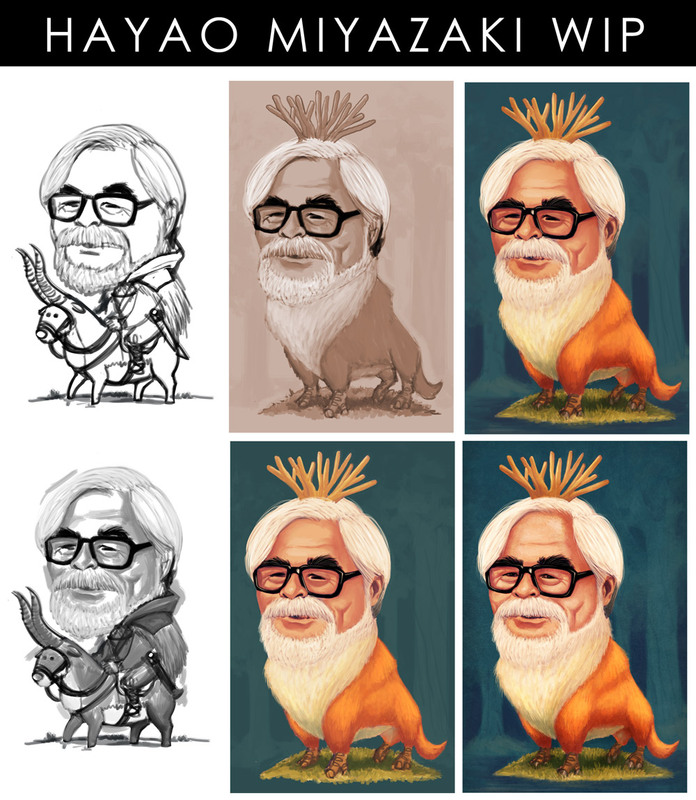 I then proceeded to refine the final details. This morning a friend recommended that I should add a Kodama to the piece to set it more in the Mononoke universe. I also added some "magic" lights all over the piece to enhance the fantasy look. Hope you like it.